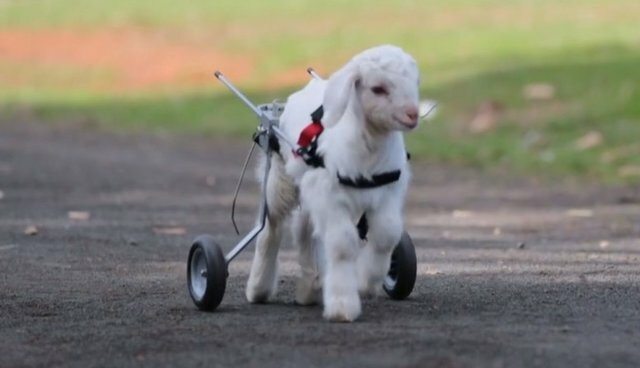 Thanks to the kindness of animal rescuers and a new set of wheels, this tiny disabled goat at a farm sanctuary in New Zealand is finally able to get around on his own. His adorable first steps may be a bit short and halting -- but all things considered, the little guy is making incredible strides. Volunteers at Edgar's Mission say that when this precocious goat, named Frostie, was first rescued, he was dehydrated, flea-ridden, and rendered immobile from joint navel disease, a condition that makes him unable to use his back legs. That might have been enough for some to consider him valueless as a livestock animal, but with the help of a special wheelchair, Frostie can now be something far more precious: himself.